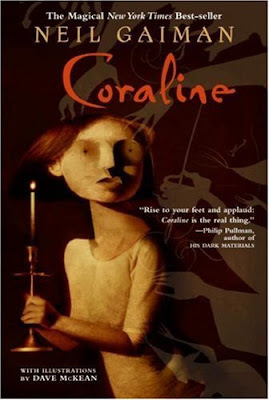 Way, way before I resolved to read the novel first before seeing any movie or TV adaptation, I went ahead and saw the animated film adaptation of Coraline - yes, even if I was informed of the award-winning children's novel upon which it was based. (And yes, it was on pirated DVD -- guilty. ) I hadn't read any work by Neil Gaiman yet, so I didn't know what to expect. I remember liking the movie very much - a stop motion 3D animation - but I did not feel obliged the urge to read the book at all. It was only very recently when I read it, and all I could think after reading it was, What was I thinking not reading this right away??? I have, after all, and by this time, read several Gaiman masterpieces and loved them so much, I've become a huge fan. Coraline is a young girl with a father who spends more time in his study than bothering with her, and who makes his own recipes, most of which Coraline doesn't find edible, and a mother who treats her like she would a stranger. When they move to a flat just a few weeks before school starts - which is actually one of three flats in a big house that was divided for the purpose - she finds herself bored and with nothing to do. She sees a door in the drawing room that her mother explains opens into nothing - a brick wall, actually - but Coraline later discovers that there's so much more on the other side of that door than there actually is. Just like The Graveyard Book and Gaiman's all other works that I've read, I loved Coraline for its creativity and uniqueness. When the author was asked where he got the idea for this, he explained that when he was younger, his family used to live in a flat with a door that opened to a brick wall, and that he always imagined what he would find on the other side. And because Gaiman has a very colorful and vivid imagination, this wonderful children's book came to fruition. It's a creepy children's book, by the way. The eerieness that I would consider a trademark of Gaiman's works is prevalent in all the chapters, and the odd characters (and their names, like Miss Forcible) and their respective peculiarities added even more to that eerie atmosphere. Coraline herself was likewise someone I wouldn't exactly call weird, but she had her moments. The best thing about this book is the lesson that it imparted to the readers: that no matter who or what your parents are, they are still your parents and you should learn to appreciate them every day of your life, and that, sometimes, the things that you want aren't always what you want. You may just not know it at first, but you'll realize it sooner or later. Of course, I love the book more than the movie adaptation. I always do.